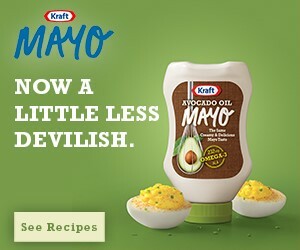 KRAFT Avocado Oil Mayo delivers the delicious taste of Mayo, and is made with avocado oil that contains 232 mg of Omega-3 ALA in every serving. Check out how our bloggers swapped regular mayo with KRAFT Avocado Oil Mayo as a healthier option in salads, sandwiches & other summer-friendly recipes. The Summer "Healthy Swap" Recipe Sweepstakes on SheKnows runs from 6/1/2017 through 7/10/2017 and is only open to individuals who, at the time of entry deadline, are legal residents of the United States and are 18 years or older. Click "here" to read the official rules. Winners will be randomly selected from all eligible entries. Good luck!